What a beautiful Saturday. It’s suppose to be 90 degrees tomorrow. Where did Winter and Spring go this year? We didn’t end up getting The Pickle this weekend which really bummed me out. It would have been the perfect weekend to go to the park. 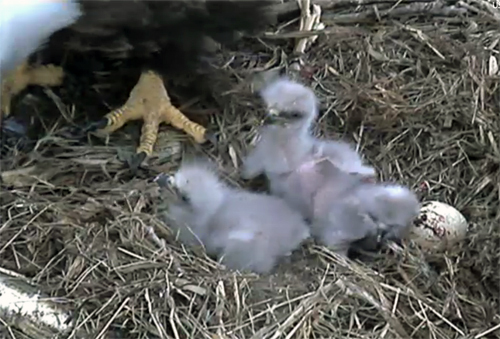 Have any of my readers been watching the Decorah Eagles Ustream? I have been watching for over the last two weeks in anticipating for the eggs to hatch. As of last night all three eggs have finally hatched. You have to take a look at these little guys. They’re so cute. 1 Pip 2 Pip 3 Pip Go! This is my first year watching the Decorah Eagles. I am absolutely amazed at how both of the parents take care of their young. My blog today is very short for one special reason. I finally purchased a domain. I am so excited to transfer everything over to my new domain. I can’t believe all of the possibilities you have with a self-hosted WordPress. I am working as hard as I can to get my new domain up and running. I might be able to get everything running by tonight. Hurray! ← A Weekend of Change.